It's the start of February and it's love month. I admit that I'm still a sucker for Super Sentai love stories. It happened even way before I started viewing more Korean Drama or Chinese Drama -- for the love stories aside for the dumb reason of eye candy. I could talk about this weird tendency of mine to like Super Sentai love stories and tend to throw lots of extreme favoritism for them -- or my tendency to do fan pairings which are totally non-existent. The first time I got into a Super Sentai love story was Hikari Sentai Maskman. 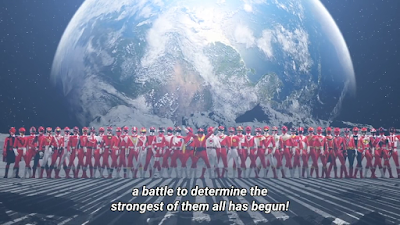 I couldn't get over the whole "must rescue Ial" motif -- which created a red-centric Super Sentai season. Need the plot to move forward? Call Takeru! While other characters were given character development -- but everything seems to focus on Takeru that much. Need I mention Takeru became my first favorite red ranger? The reason was because of his love story with Ial and the love conflict it created. He was also the very anti-thesis of Kiros -- he represented pure, serene love while the latter is the representation and the embodiment of lust for Ial's beauty. But that wasn't going to be the last time I would be a sucker for that. It was the beginning of it! I soon got into Jetman which became my personal favorite. Maybe, it's because I was seriously missing someone I liked so much -- and it was my motive in life to get back to her. Jetman had some interesting love stories whether it'd be Ryu's love story with Rie or it would be Gai's relationship with Kaori -- which I really felt like WTF was Toshiki Inoue thinking in not letting both rangers have their happily ever after? I thought about Ryu and Gai were fleshed out as they got deeper with their women. Ryu who wanted to put his professionalism first fell apart when he discovered Rie was Maria -- and Gai became a better person with Kaori. I even love the scene where Gai and Kaori both came back to set Ryu straight! But in the end, Ryu lost Rie and I still feel the sorrow there. I felt like after all he's been through -- why get tragic and kill Rie? Hmmm... even with all this Jetman saved Super Sentai from cancellation causing the franchise to head towards a new direction. Jetman wasn't the end of me being a sucker for love stories in Super Sentai. I admit, I wanted more love stories hence I end up loving to make crack pairings no matter how stupid they are -- or some crazy pairings that come out of nowhere. I could even remember how I thought of Takeru Shiba x Mako as a possible couple last 2009 in Shinkenger -- though they're not even established as one. In extension, I also shipped Chiaki x Kotoha -- though some want a Takeru Shiba x Kotoha which IMO feel like Ryu and Ako dating. Heck, I wonder is there or was there even a rumor Tori Matsuzaka is dating Suzuka Morita?! I even had a bit of crack for Hoji x Jasmine (though I started with Tetsu x Jasmine) while the official pairings are Sen x Umeko and Ban x Marigold -- but Marigold is never mentioned again... pfft! Other shippings I had were Marvelous x Luka and Joe x Ahim, Chiaki x Kotoha, Kenta Date x Chisato and lately I'm shipping Lucky x Hammy in Kyuranger. I thought about why I end up thinking more highly of Abaranger compared to Zyuranger and Kyoryuger. For the record -- I really became a sucker for the whole Asuka x Mahoro couple. Watching it made me think the difference in the couple is that Asuka earns his happy ending while Ryu didn't. While there wasn't too much of lovey-dovey in Abaranger (since Yatsudenwani's desire for Ranru is lust and not love) but I love how Asuka still wants to save his wife. It's the ending that Ryu deserved. Ryu and Gai should have had their respective women! But I could still think of how Abaranger managed to at least give a different variation of Ryu's tragic love story. I could also talk about Carranger. Yup, Carranger may have been a comedy, it didn't do much to budge the ratings much higher (until Megaranger) but I really enjoyed the love story of Kyousuke and Zonette. It was almost like a throwback of Poison Ivy's crush on Batman or how Catwoman had a crush on Batman. Neither villain knew the identity of the hero. Zonette only likes Red Racer (at first) but it ended up with her liking the monkey face behind the mask. I even like how Kyousuke actually battled out of suit for Zonette's love. Carranger may be mostly nonsense -- but you can't deny that Zonette's redemption involved Kyousuke! Then I have my still ongoing tendency to crack-ship Kenta and Chisato -- though attractions in Megaranger were one-sided. Gingaman vs. Megaranger (which I treat as non-canon due to VS. Movies usually being non-canon) seems to suggest that Kenta and Chisato have become a couple. If there was one favorite plot of mine from Dairanger -- it's the Ah! My Goddess! arc with Daigo and Kujaku. I thought about Kunio Fuji's involvement and how sad I was he never became a head writer. He was a major player in the Soda era so why wasn't he even given at least one head writing project? I couldn't forget the teary moments and the decisions that Daigo had to make. I even cried as an adult watching Daigo make the decision where he chose the world over Kujaku but it's all for the best. I thought about it that it's one of the best tragedies written in Super Sentai! It was a love story of selfless love as Daigo chooses the world's safety over his love life. Then there's Timeranger. I've known for a long time with the whole 1,000 year gap romance. I thought about how Tatsuya and Yuuri as well as Domon and Honami may forever sing Aqua's "Turn Back Time" theme song as many times as possible. I couldn't get enough of this "we can't be together but we will fight fate" stories. No, Yuuri didn't have Captain Ryuya as an ex-fiance so a love triangle between Tatsuya and Ryuya for Yuuri never existed. Honami didn't think Domon was Time Yellow. She gladly accepted Domon for who he is though I still want to ask Yasuko Kobayashi where in the world did they find time to procreate? It's almost as confusing as Zyuranger's ending where and when Griforther and Lami eventually had their child together. The teariest part had to be when Tatsuya and Yuuri were literally torn apart by time itself. There were also minor and major love stories. If I could talk Gekiranger wasn't all lovey-dovey except we had Rio and Mele. 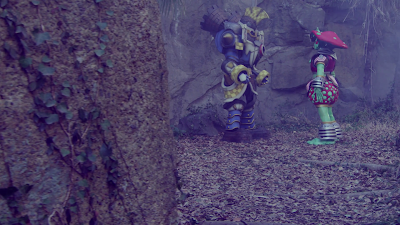 Turboranger also had Yamimaru and Kirika in the second half. It also had Zimba and Jarmin are somewhat attracted to each other due to their hatred for human love. I thought about some one shot love interests. Hoji had a one shot love interest with a woman whose brother he had to delete out of duty. Some rangers had one shot love interests like Kenta and various one-shot guest women in Maskman, Kasumi had an attraction to a mysterious scientist in Fiveman (who was acted by Kazunori Inaba), Kenta Date had various love interests though it seemed that he's had more teases with Chisato (while he's attracted to Kouichirou) to name a few. On the other hand, there are times I felt like sometimes you have love stories that just pop out of random. One good example would be how until now, I still think Ryu and Kaori marrying each other can be so totally random at times. Sure, Kaori helped Ryu overcome his grief of losing Rie but that doesn't automatically mean that they have a chemistry working on. Worse, Inoue even recreated it in Kamen Rider Kiva with Nago and Megumi when the two just don't get along. 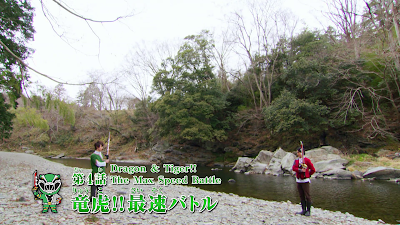 Others would also involve how I still feel the whole Daigo Kiryu x Amy in Kyoryuger was thrown in at the last minute. But as said -- Super Sentai romances may have its ups and downs, it doesn't always happen but I'm still a fan of Super Sentai love stories no matter what. You forgot Rami and Grifforcer. It was nothing exciting or a last minute thing but was already established with Rami's introduction. Thanks for bringing that up. I thought their love story wasn't all too interesting and that they were just an average villain couple.